Тhanks to the active voting by the public, Unimasters was voted as a National Public Champion to represent Bulgaria at the European Business Awards. 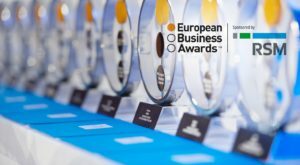 Adrian Tripp, CEO of the European Business Awards said: “The public vote gives companies the opportunity to showcase their success to a worldwide audience, as well as engage existing stakeholders and potential new customers. Well done to Unimasters Logistics it is a great achievement.” The competition was set up to celebrate and promote business success and support the development of a stronger business community throughout Europe. Unimasters will compete against 33 companies across Europe and only one will be selected as the next European Champion in the final stage of the Awards. We ask everyone who wants to support us to vote until April 27th, including those who have made it through the first stage.